Whatever your event, we have a variety of different screen options that can fit your needs. Along with our two FireFly mobile screens, we also have two larger 12×19 foot DragonFly screens. These 10mm pixel pitch LED tiles provide great picture quality, as well as a large screen that will tower over the crowd. Take a look at this video with all the information that you will need when renting a DragonFly video wall. For more information on the DragonFly video board, you can go to the DragonFly page on our website. You can also contact us at 612-759-1012 or baum3@earthlink.net. 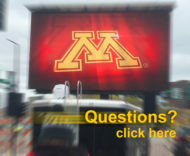 Fire Up Video provides mobile LED screens for outdoor events across the Midwest, in states such as Iowa, Minnesota, Michigan, Illinois, Ohio, Indiana, Tennessee, Kentucky, Missouri, North Dakota, South Dakota, Nebraska, Colorado, Kansas, and more.